U.S. stocks shook off an early stumble and climbed Thursday, led by gains in technology companies as Apple reached $1 trillion in value. Consumer products and health-care companies rose as second-quarter results from corporate America continued to surpass investors’ expectations. Overseas markets fell after the White House said it will consider even higher tariffs on Chinese imports, escalating a trade conflict between the world’s two biggest economic powers. KEEPING SCORE: The S&P 500 index rose 15 points, or 0.5 percent, to 2,828 as of 2:10 p.m. Eastern time. 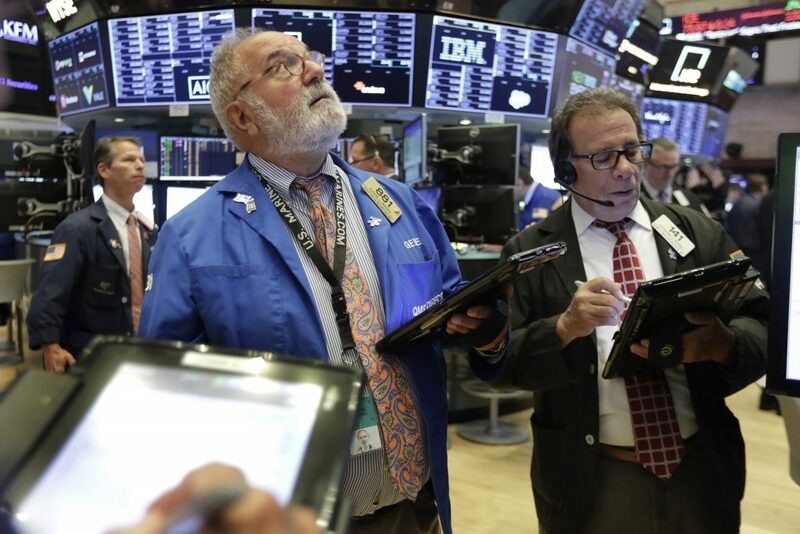 The Dow Jones Industrial Average rose 23 points, or 0.1 percent, to 25,357. The Nasdaq composite jumped 95 points, or 1.2 percent, to 7,802. The Russell 2000 index of smaller-company stocks added 12 points, or 0.8 percent, to 1,681. TRILLION-DOLLAR TITAN: Apple rallied for the second day in a row and its market value reached $1 trillion shortly before noon. It is the first publicly traded company to hit that milestone. With a rise of 3.4 percent to $208.24, Apple’s value stood at a bit more than $1 trillion. The stock jumped 5.9 percent Wednesday after Apple announced strong quarterly revenue and higher iPhone sales prices and gave a solid forecast for the current period. Saudi Arabia’s state-owned oil company, known as Saudi Aramco, has taken steps to prepare for an initial public offering, and Saudi officials say the IPO will value the company at around $2 trillion. But it’s not clear when that offering might happen and without it, it’s difficult to value the company. THE QUOTE: Despite its eye-popping capitalization, by some measurements Apple stock isn’t very expensive. The stock is now trading at about 17.7 times its expected earnings over the next year. That’s about the same as the rest of the S&P 500, and Apple has bigger profit margins. GBH Insights analyst Daniel Ives said that the milestone reflects Apple’s unique position as a technology company that sells numerous products that work together and that people stick with. EARNINGS POWER: Consumer-products maker Clorox rallied 6.3 percent to $142.67 after its fiscal-fourth-quarter profit and its forecast for the current year were both better than analysts had expected. That helped other companies that make household goods. Procter & Gamble gained 1.9 percent to $82.16. Animal-health company Zoetis jumped 5.9 percent to $91.09, and drugmaker Regeneron added 6.6 percent to $395.64. As of Wednesday, more than 300 companies in the S&P 500 have reported their quarterly results. S&P Global Markets Intelligence says more than 80 percent of those companies have announced larger profits than analysts had expected. Total S&P 500 earnings are expected to grow 24 percent compared to last year. TRADE TALK: The Trump administration said it might put a 25-percent tax on $200 billion in imports from China. That is up from a 10-percent tax it proposed in June. The government will seek public comment on the higher tariffs. A hearing on the levies is scheduled for Aug. 20-23. JUICED UP: Tesla climbed 14.2 percent to $343.54. The electric-car maker said production of its lower-cost Model 3 sedan is growing and CEO Elon Musk said the company doesn’t expect to need to raise more money from investors. TRIPPED UP: TripAdvisor sank 13.9 percent to $49.62 as the travel-booking site reported weaker sales than analysts had expected and said revenue from hotels decreased. BONDS: Bond prices edged higher. The yield on the 10-year Treasury note fell to 2.99 percent from 3 percent. OVERSEAS: The DAX index in export-reliant Germany tumbled 1.5 percent and the CAC 40 in France lost 0.7 percent. Britain’s FTSE 100 slid 1 percent after the Bank of England raised its main interest rate. Japan’s Nikkei 225 index sank 1 percent and Hong Kong’s Hang Seng dropped 2.2 percent. The Kospi in South Korea shed 1.6 percent. CENTRAL BANKS: The Bank of England raised its key rate, as expected, but said it would be cautious about further increases as Britain prepares to leave the European Union. The bank’s main interest rate is the highest it’s been since 2009, during the global financial crisis. The pound fell to $1.3061 from $1.3130. ENERGY: Benchmark U.S. crude rose 2.1 percent to $69.09 a barrel in New York. Brent crude, used to price international oils, gained 1.8 percent to $73.67 a barrel in London. CURRENCIES: The dollar rose to 111.68 yen from 111.56 yen. The euro slipped to $1.1602 from $1.1664.